BBTFs Community Forums | Batting protection from a MLB managers point of view. Batting protection from a MLB manager’s point of view. First, I am not trying to get a debate going about whether or not protection in a batting line up structure does or does not have a significant impact on a batters performance. I am, hopefully with an open mind, asking for some facts that one might be able to use, pro or con, in such a debate. Our discussion about protection in the lineup at the scout.com forum about the cardinals http://mbd.scout.com/mb.aspx?S=321&F=2089#S=321&F=2089&T=356672 is winding down. There are two sides, those who believe protection has significant effect on the game with so far no clear examples where a batter moved to or from a protection slot and had their batting stats change significantly in the direction supporting protection, and those who say protection has no significant effect on batting and were able to show stats for every example raised that there was no significant impact. 1) Has any current MLB team manager gone on record pro or con the protection concept? “For fun, I did Matt Williams, as he spent some time protected by Barry last season. So the author is inferring Dusty Baker supports the protection concept, but there is nothing in writing to back up this conclusion. 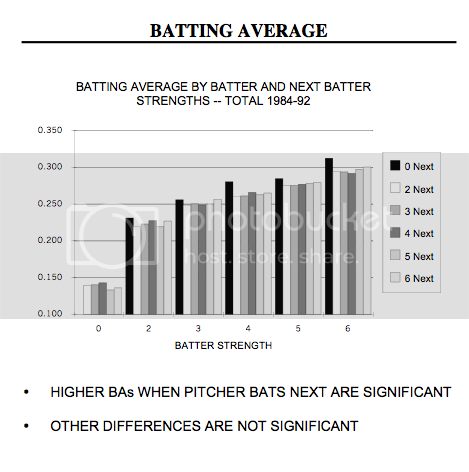 2) Are there any good examples with batting statistics where a player’s position in the line up was changed from before to after a power hitter, or vice versa, where there is enough at bats and no other circumstances that could explain the batting stats supporting the concept of protection? Take the example above for instance. There are stats for before and after Bonds, with at least 100 ab in each sample, that show that Williams performance was worse in front of Bonds than after. But this does properly support the opposite of protection, since there is an alternate theory that Williams was put in front of Bonds when Williams was in a slump to try to help him. Without a time analysis of the two samples (eg as Williams started to get better at the plate, he was moved back to his other spots) neither theory can be deemed more likely than the other. Another, perhaps better example of a suggested batting situation that on first glance might support protection, but on close examination there are other plausible reasons for the change in batting is Chris Duncan’s performance in 2006 for the Cardinals. Chris’ numbers improved considerably for the Cardinals compared to AAA, and he spent a lot of time batting in front of Albert Pujols, so this supports protection working right? However, closer examination shows two items that counter this conclusion. First, he was platooned against lefties, so his L/R pitcher splits were much different in AAA vs MLB. Second, if you look at his AB behind Pujols, there is not that much difference between the two. Longer term evidence not supporting the protection conclusion is that he is even better the start of this year than last year, despite the fact Albert is off to a horrible start, the worst slump in his MLB history, and just about the worst slump on the team. So one argument is that from AAA to 2006 to 2007 he is just maturing as a hitter, and has been getting bettor mentoring from the likes of McGuire, Pujols, and Larry Walker besides McCrae. Any concrete, specific examples for these two questions, with links, would greatly be appreciated. if the individual effects were too small to measure. In all, the players had 7407 AB protected, 5092 not protected, and 4032 taking the smaller subset for each player, which is enough to make totals meaningful; the standard deviation of batting average in 5092 AB is only .006. Let’s add together the differences, to see what would have to be changed for the players to have matching splits in batting and slugging averages. A plus sign below means that the extra hit would have to be moved to the “Unprotected” totals to get a balance, because the player hit better when protected. In baseball terms, that’s a small split, with little effect on the players’ value. But in statistical terms, it’s actually fairly large because of the huge sample; 12499 AB is almost one-sixth of all the AB in the AL that year. I estimate the standard deviation of the difference in SLG to be .015. 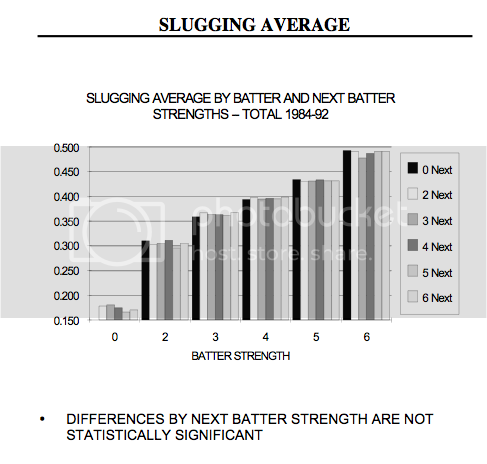 Thus the .026 isn’t statistically significant evidence that protection hurts hitters, or even that it doesn’t help, but it is statistically significant evidence that protection doesn’t help SLG by more than .004. “Baseball Between the Numbers” specifically debunks the lineup protection canard. From two directions - first it notes that there are almost no situations when it makes statistical sense (and not just ‘max runs sense,’ but Herm Edwardsian ‘win the game’ sense) to “pitch around” somebody that occur in an actual game. And those situations which do occur all involve 2001-2004 Barry Bonds. Secondly, there are no demonstrable “protection effects” - hitters do not perform better with a better hitter hitting behind them - or at least there is no demonstrable effect of that nature. And here is a FAQ about protection, and covers strong and weak protection. I did not have the Pankin link before. By the way, if you go to his web site, download the word version, then click on the graphs, convert them to excel graph, change the graph format options to show values, rotate them to 90 degrees so you can see them, you can get the numbers for each bar in the graphs. I was going to expand the graphs and measure their values until I found this trick. Is there a link to the large quote? I would like to get more details on this study. I don’t have a link for the BP quote, but if you paste it into a Google search, it will come up a few times. I assume it was in one of their books, and not from a page, unless their premium-access pages don’t come up via search engines.